As tennis is at the core of Midtown Athletic Club, many of us are looking forward to the Wimbledon games set to take place in early July. Wimbledon is widely regarded as the most prestigious tennis event in the world and it goes without saying that the most elite tennis players will be seen on the court in London. This year, Midtown is honored to announce that one of our very own coaches, Michael Byrd, has been invited to Wimbledon to participate in a program led by Anne Pankhurst of the UK. The purpose of the program is to bring the latest in teaching practices, strategy, tactics, and injury prevention techniques from the pro tour to the professional teaching coaches. This program chose 18 coaches from the United States from a selection over 100 applicants. Coaches will have access to matches, practice sessions, and stadium areas including the player’s lounge. Coach Mike is excited to bring back best practices used by the pros and incorporate those lessons into sessions with other Masters of Tennis professionals. Mike has been coaching for over 20 years and has earned the highest certification available from the PTR for teaching professionals – the Master of Tennis - Performance. Mike has coached all age groups at Midtown, including children, teens, varsity high school, and college players as well as recreational adult club players. I had the opportunity to visit with Mike and hear his story as well as sit in on a tennis lesson. It didn’t take long to fully understand what makes him not only a great coach but also a great person that we are proud to have at Midtown Palatine. As I asked Coach Mike how he found out he had been selected to the Wimbledon continuing education program, I could see the excitement and sense of accomplishment in his eyes. He was finishing up a long day of lessons, cleaning up the courts, and putting balls away, and began getting notifications on his watchfrom friends congratulating him. Confused, he went to his iPad and opened his email and began scrolling through. That’s when he saw the message confirming the Wimbledon invitation. A few minutes later he saw a colleague nearby who asked him what’s going on. Mike replied, “I don’t know, I just received an interesting email. I’m going to Wimbledon!” He said he was still in shock and didn’t know what to think or how to feel. But he did know he was on cloud nine! We went on to discuss what Mike thinks makes for a good coach. His list of top coaching skills focused on the mental and emotional approaches best suited to develop young players into well-balanced young adults over time. This was clearly much more than an instruction manual for top-spin backhands and overhead smashes. He explained how he tries to embody these positive mental and emotional behaviors on and off the court every day. Mike isn’t just a coach to members, he’s a friend. As we walked around the club he was the recipient of constant high-fives and hellos. He seemed to know everyone and everyone was genuinely excited to see him and stop for a quick chat. He takes pride in making the sport accessible and fun regardless of the skill level of his student. 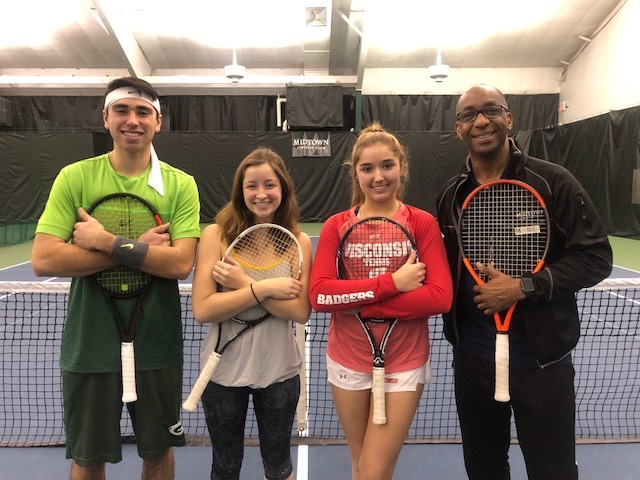 He is the first to admit that tennis isn’t easy, but he wants to ensure everyone under his care is having fun and enjoying their lessons That approach, he says, can help make the game a life-long hobby to be shared with family and friends alike. Join us in congratulating Coach Mike on this prestigious recognition as he prepares for the Wimbledon 2018. Amanda Failla is the Assistant Marketing Manager at Midtown Athletic Clubs. Amanda spends the vast majority of her time writing, editing, and staying in the know of what is going on across Midtown Athletic Clubs. When not working, you can find Amanda training for marathons or at the dog park with her two Goldendoodle pups. Coach Mike is my favorite coach of all times. He has great advice on and off the courts and is always helping people to improve their games. So excited to hear about his journey to Wimbledon Congrats Coach Mike!! !